Ancient or, for that matter, more recent graffiti, especially on Temple and Tomb walls, can be an eyesore. To be brutally honest most graffiti is an abomination, although there are exceptions. On my travels in Egypt over the years I have stumbled across some very interesting examples of self indulgence (i.e.) Belzoni, Salt, Drovetti etc. Of course we are all aware of these individuals due mainly to their deeds in Egypt through the 19th Century. Next time you are viewing the incomparable Temples and Tombs on your holiday take a note book and pencil with you jotting down the graffiti as you go, on returning home from your trip you will have many an interesting hour tracing the perpetrators on the internet. There are numerous interesting travellers who left their mark; a touch of investigation can be very rewarding. Remember of course when tracking these intrepid individuals down many were travelling in very difficult circumstances, the great cholera epidemic of 1831, not to mention gun toting tribesmen. There were also numerous unforeseen hazards such as venomous snakes, scorpions, dangers like diarrhoea, food poisoning the shortage of drinkable water, problems that today would be possibly life threatening to them and certainly fatal if encountered. Before we start, it would be easy for me to tell you exactly where the graffiti are except to say the Temple, Tomb or Pyramid involved. Ah! Have I noticed a touch of disinterest, maybe apathy, well in my defence I had to find them, believe me its great fun! Why not start our adventure at the Ramasseum, the atmospheric Mortuary Temple of Rameses the Great, where Shelley’s sonnet Ozymandias was inspired by the great ruler’s colossal statue. 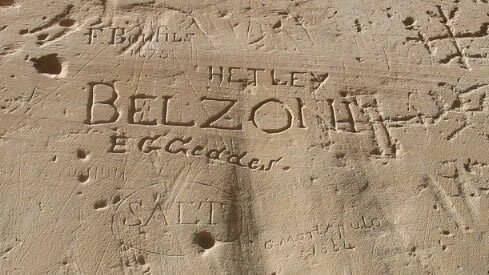 Here, there are at least two Belzoni graffiti, dated 1816, with one of Salt, two giants of antiquities acquisition. Both gentlemen have reams written on their respective careers. 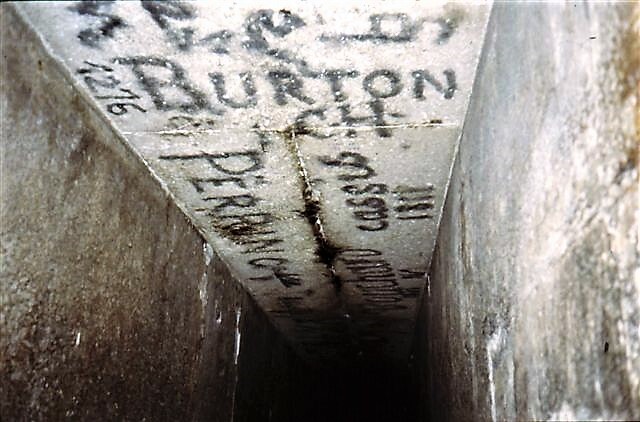 Now, one you will not know unless you are related is C.H.Harrison, an American who inscribed his graffiti not only at the Ramasseum but on top of Khufu’s great pyramid at Giza, by all accounts beside the graffiti of Jenny Lind, the Swedish nightingale (1820) – how cosy! C.H.H was accompanied at the Ramasseum by his son W.P.Harrison, and a family friend, J.W.Amberg 1888, all leaving their respects. Carter Henry Harrison published a series of letters in the Chicago Tribune circa 1889. For more information refer to Roger O. De Keersmaecker. 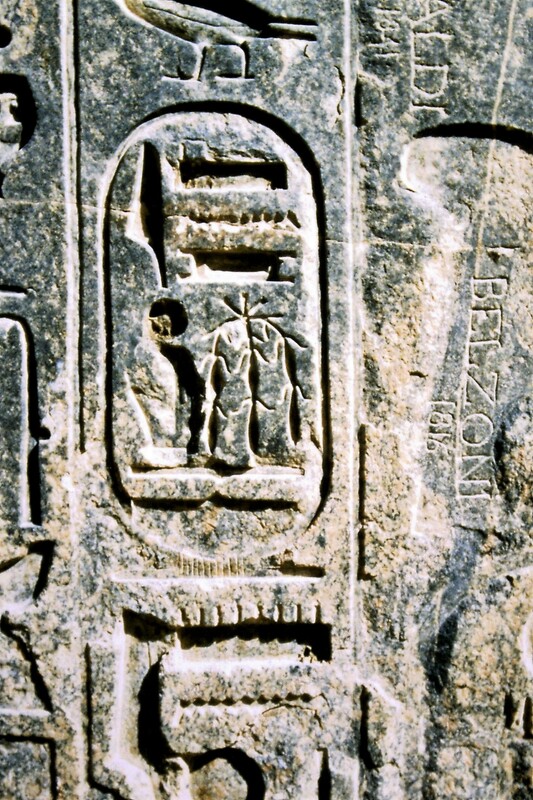 At the Mortuary Temple site of the last great Egyptian Pharaoh Ramases III at Medinet Habu, there is an abundance of interesting graffiti, mind you, there is so much to see of pharoanic interest it may take you a lifetime to even think of seeking out graffiti. That said, when you finally find the time (hence my advice earlier to carry a notebook and pencil) you will be rewarded by the signatures of some real characters of the 19th Century. Those pioneering days that I personally long for, but sadly are just momentary lapses in my concentration. The likes of James Burton, a gentleman misfit who is buried in Edinburgh with the epitaph “A zealous investigator in Egypt of its language and antiquities” his secretary, Charles Humphreys, Joseph Bonomi, sculptor and draughtsman who travelled together in 1825. A certain David Bushnell of Ohio, who resided in Egypt in the mid to late 1830’s, was one of the subjects (Nebby Daoud) in a book written by a New York senator named James Ewing Cooley. The book The American in Egypt a satirical account of the British in Egypt published in 1842, visit “American Travelers in Egypt” for more information. The particular wall in question is full of fascinating characters, some of whom literally left their marks on society as well as the wall in question.